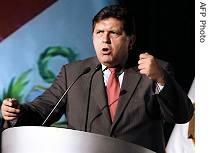 The White House said Mr. Obama called President Alan Garcia to discuss how to restore economic growth to the hemisphere and other shared goals. Mr. Obama said he is looking forward to working with Peru toward a successful Summit of the Americas in Trinidad and Tobago April 17-19. He also thanked Mr. Garcia for Peru's regional leadership in combating drug trafficking. The 5th Summit of the Americas will be Mr. Obama's first opportunity since becoming president to address most members of the Organization of American States (OAS).